Great Backcountry Tours For All Abilities! 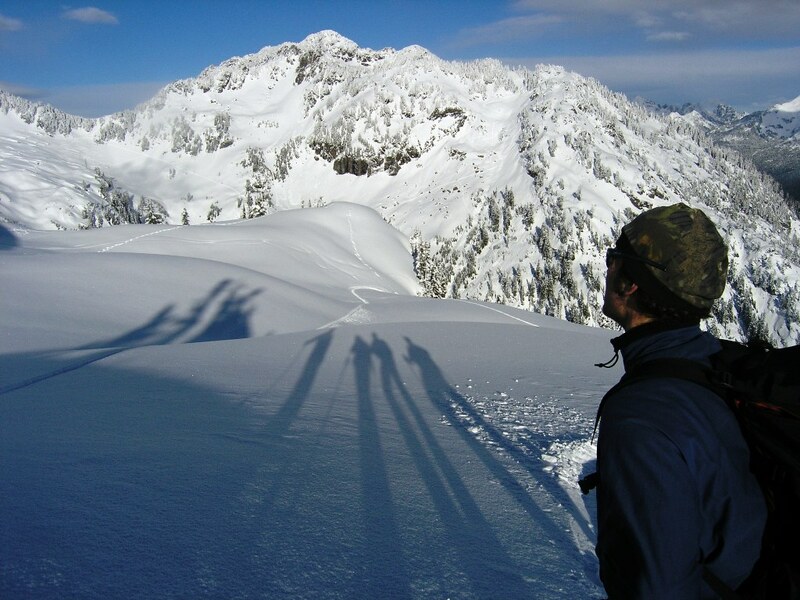 Backcountry skiing is perhaps one of the most rewarding of all winter activities. A combination of majestic views, untouched snow conditions, and group camaraderie makes skiing in the backcountry an activity not to be missed. With the progression in ski equipment and growing crowds at the ski resort, backcountry skiing is gaining popularity. Mountain Madness offers several ways to get out and enjoy the backcountry this winter. Our guides are trained avalanche professionals, gifted teachers and have an intimate knowledge of the area. There is no better way to learn the fundamentals or find the deep white stuff. If you are intermediate or advanced skier and want to find the secret stashes of untouched powder or if you just want to refine your avalanche/ ski mountaineering skills, join one of our professional guides for a customized backcountry expereince in one of the spectacular location listed below. Offered every weekend. Please contact us for details! The Birthday Tour is classic spring ski tour that is available when Washington Pass opens in April or May. The Tour starts at the Blue Lake Trail Head and ends down at the hairpin of Hwy 20. The tour circumnavigates the Early Winter Spires and accesses many open bowls and chutes. If you are new to backcountry skiing this is guaranteed to get you hooked. The Birthday Tour provides plenty of skiing for all abilities and incredible views of the North Cascades. For many The Birthday Tour represents an annual rite to spring. April and May. Please contact us for details! A detailed equipment list will be sent to all participants. For people with basic ski mountaineering skills and experience, a ski descent down one of the Cascade peaks is a must do! 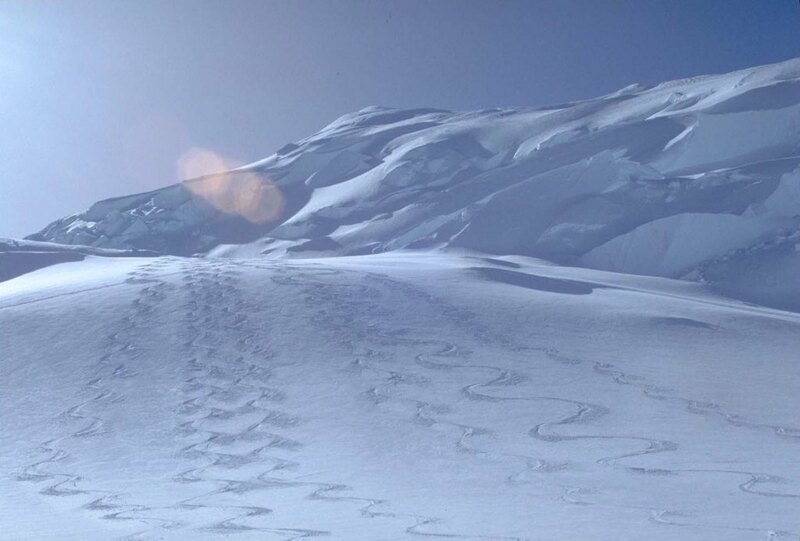 Typically, the entire length of the approach and ascent can be skied – car to summit, and back down again. With a healthy snowpack, lots of terrain options are available, so join us this spring and experience the pristine value of skiing one of the Cascade volcanoes or high peaks of the North Cascades. 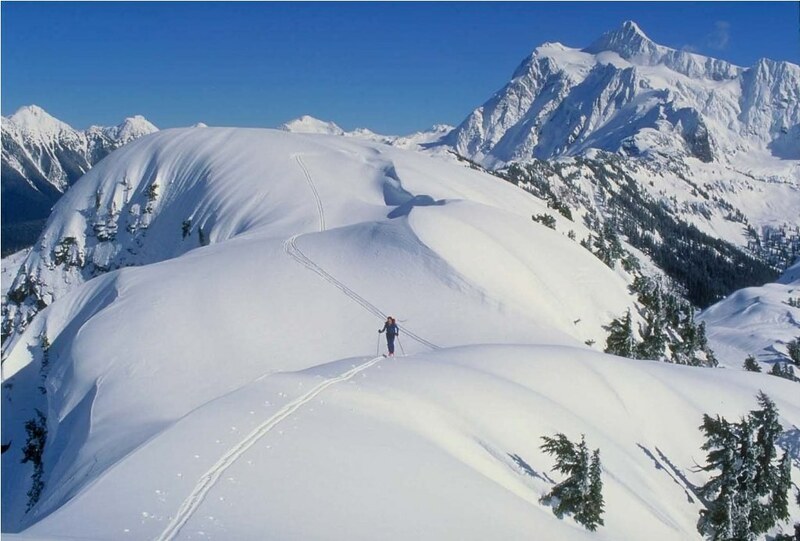 Mount Baker, the highest peak in the North Cascades, is a fantastic mountain for climbers AND skiers. Not only are its two standard climbing routes (the Easton and the Coleman-Deming Glaciers) also wonderful ski descents, but under certain conditions the mountain’s harder snow and ice climbs are now considered “skiable” by a growing cadre of local ski mountaineers. While on the summit plateau, ski over to the edge of the Coleman Headwall, peer down to the north, and consider what must have been going through the heads of the young skiers who first skied this feature 10 years ago – and then turn around and ski over to the Roman Wall and enjoy the moderate and imminently skiable slopes of the Easton Glacier instead – a 7,500 foot run! With numerous glaciers, tumbling waterfalls, and open alpine forests and meadows sprinkled among lava flows and rim rocks, majestic Mount Adams is not only the second-highest peak in Washington at 12,276 feet, but also one of the most beautiful skis around. As a composite volcano, Adams resembles Mount Rainer almost as a mirror image and offers similar ski and climbing opportunities, but with more solitude. Our route on the South Spur descends approximately 7,000 vertical feet and has unobstructed views of Mount St. Helens, Mount Rainier, and Mount Hood. 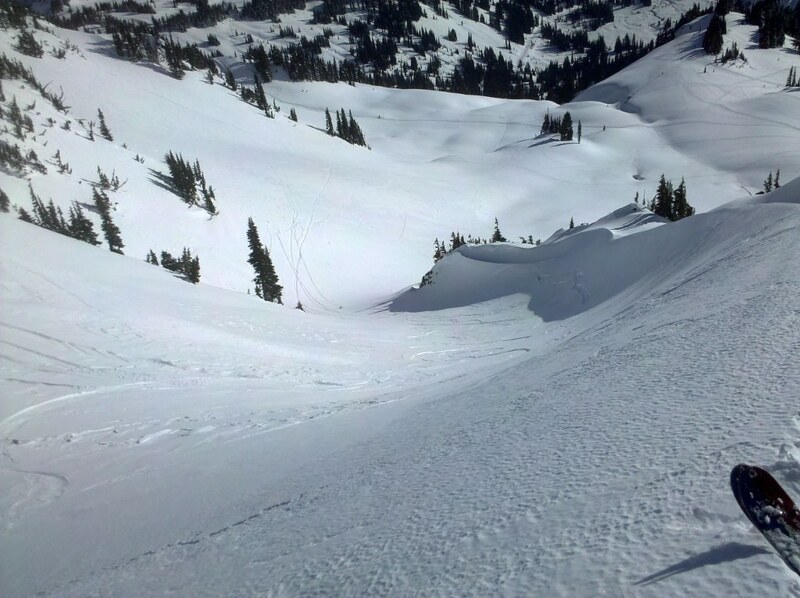 Custom Dates Available: Call our office to schedule your NW ski descent.